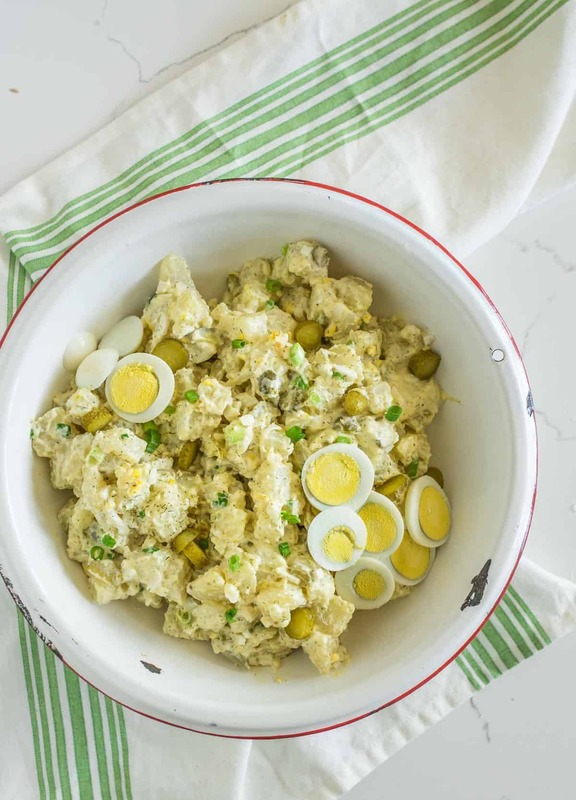 Instant Pot Potato Salad that only has a 5 minute cook time. 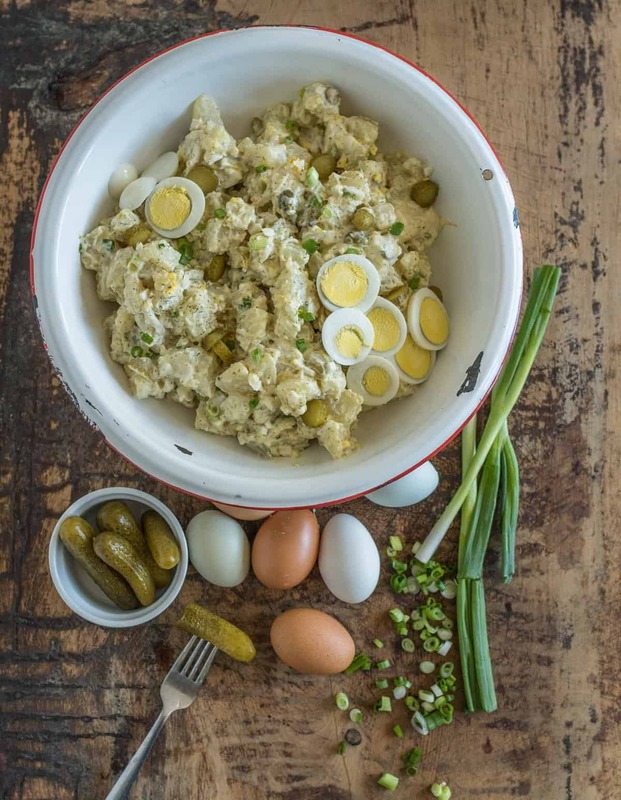 The eggs cook right along with the potatoes – plus there’s a secret ingredient! Spoiler alert: not everyone who buys and tries an Instant Pot loves it. It takes time for the IP to come up to pressure, it takes time for the pressure to be released after the cooking period. When it comes down to it, not all recipes are magically faster just because you threw it in a pressure cooker. If you are trying the recipes that aren’t faster (expecting it to be fast), you are going to be disappointed for sure. Here’s the secret to the Instant Pot though. Using it to make recipes where it really does produce a better product or a quicker cooking time will change your IP game. I think that chicken and pork cooked in the Instant Pot are pull-apart amazing. Make those. I also think that things like cooking dried beans, steal cut oats, eggs, chicken stock, and potato salad are so much faster and easier in the IP. Make those, too. If you are trying the right recipes in the Instant Pot you’ll see what all of the fuss is about. I use mine often and love it. It really is faster. 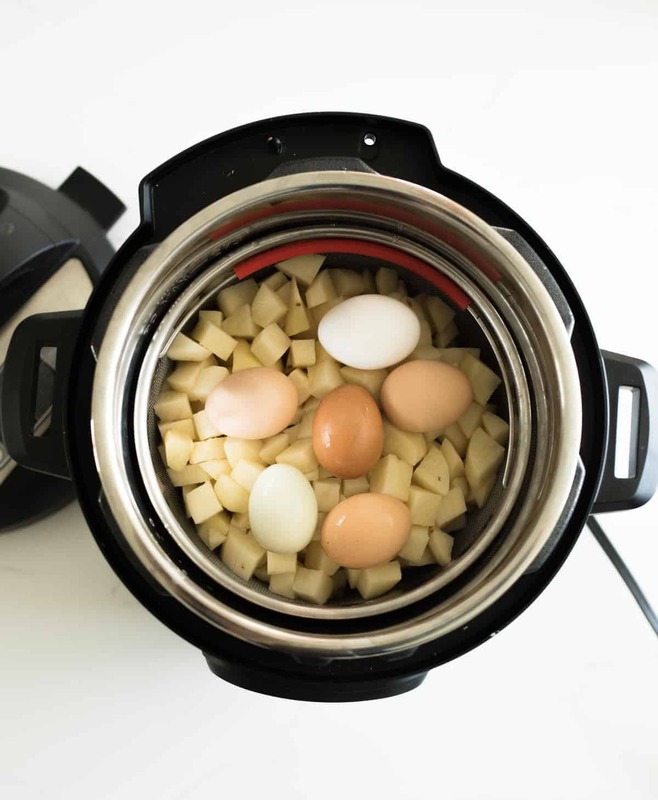 You cut your taters and toss them in AND you cook the “boiled” eggs at the same time! The steamed potatoes have an amazing texture (much fluffier then boiled potatoes). There’s a 4 minute cook time! Once you close the lid and wait for it to come to pressure, cook, and release the pressure, you are looking at 25-30 minutes of IP cooking time, which is still faster than boiling potatoes most of the time. There’s no heavy pan of hot potatoes and water to drain! This is one of my favorite parts of making potato salad with the Instant Pot. I got this steamer basket for my IP (it fits both the 6 and 8 quart) and I love it for this recipe as well as steaming eggs, artichokes and more! You can peel and cube traditional russet potatoes. Just be sure that you are thinking small bite-sized pieces. I also tried leaving the peel on new red potatoes and they cooked up really nicely. Both are great options. 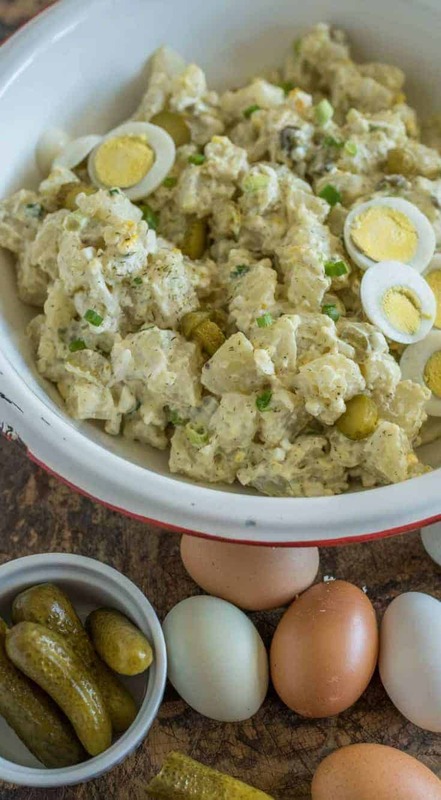 You don’t have to make my potato salad “dressing” to make IP potato salad. Just use the cooking method prescribed and throw in what you like, or make your mom’s version starting after the potatoes are cooked. Not a fan of dill pickles? Leave them out, though don’t skip adding the pickle juice – that’s the secret ingredient! It’s the acid in the recipe and will taste more like dill vinegar than anything. I like to let my potatoes cool just a bit before adding my mayo. Mayo and hot potatoes is an odd combination to me. Peel and prepare your potatoes. You should cube them into small bite-sized pieces, 1/2 to 3/4 of an inch across. Add one cup of water to the insert of your Instant Pot. Place the prepared potatoes in a steamer basket that is Instant Pot safe and place the steamer and potatoes inside the Instant Pot insert. Place the 6 eggs on top of the diced potatoes. Put the lid on the Instant Pot and set the valve to seal. Select Pressure Cook, High Pressure, and choose a 5 minute cook time. When the cook time has finished, use the quick pressure release. When the valve drops, carefully open the lid to your instant pot. Use tongs to remove the eggs and set them aside. Carefully remove the steamer basket of potatoes from the Instant Pot and set it inside a large bowl. Dump the potatoes into the large bowl and let them cool about 15 minutes. They can be warm but you don’t want them to be steaming hot. When the potatoes have cooled a bit, add the mayo, pickle juice, onions, chopped dill pickles, mustard, salt, pepper, dill and sugar. Stir well to combine. Peel and chop the eggs and stir to combine. I tried this with red potatoes and did not peel them, and it worked great, too. 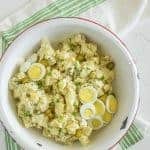 There are so many other great recipes hiding in my archives if you are in the need for something to take to a party, or simply looking for some fun food ideas now that the kids are home for summer. I hope you’ll dig in and enjoy the years and years of recipes I have been posting. I’m so glad you’re here. Enjoy from my kitchen to yours! What size IP for this recipe? Mine is an 8 quart but I’m sure it’ll fit in a 6! Such a great idea to cook the eggs with the potatoes! 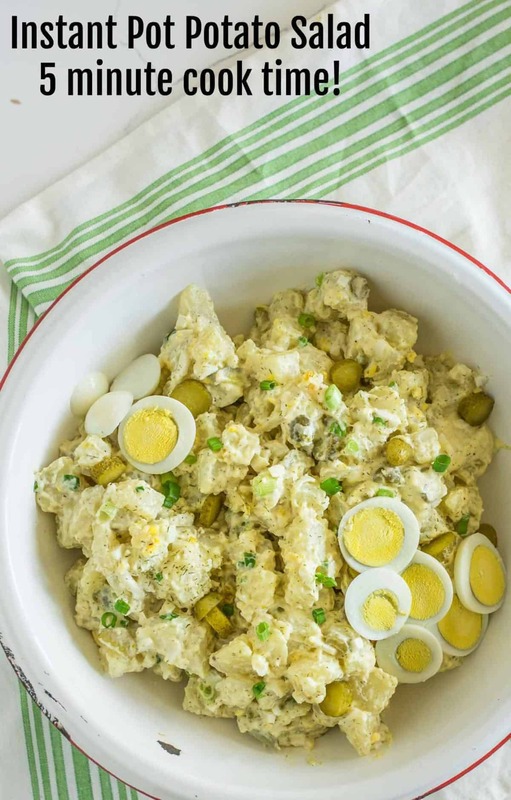 I definitely have to try potato salad in the IP. I never get tired of learning new ideas for using it! I LOVE hearing that! I hope that you make it again and again friend. And thanks for the tip on not needing the strainer, I’m glad you make it work with what you had!